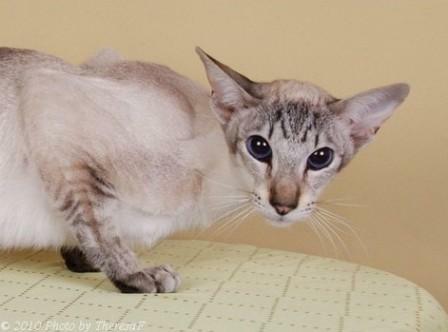 Siamese cats are universally recognized by their most defining feature - their coat. 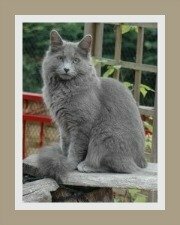 Its coat has inspired the development of different cat breeds around the world. The coat is short, fine in texture, silky, shiny and lies close to the body. 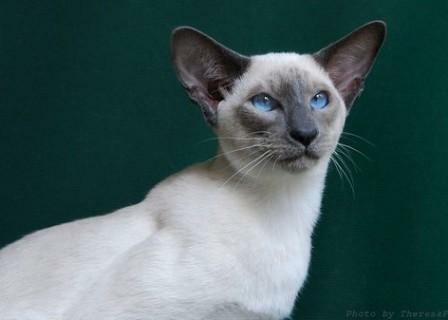 All Siamese have a color point pattern meaning that all the extremities (points) of the body i.e. face (or mask), ears, legs, paws and tail are pigmented with a darker color. The points of color must be even and be in clear contrast to the rest of the body. The background color must also have an even color, with shading that is subtle on the back and sides. 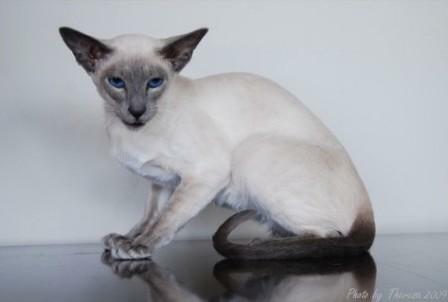 Interestingly, Siamese cats are not born with color points. 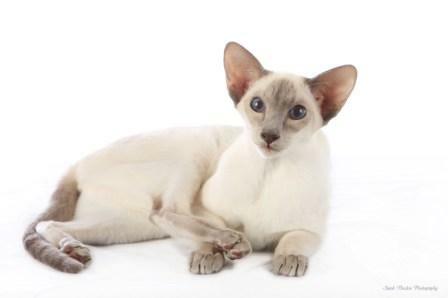 Siamese kittens are born white, it's only around the 5th or 6th day that the points begin to appear and the coloration is only complete at around 12 - 15 months. Another truly fascinating feature is that points are created by a temperature-sensitive enzyme that restricts darker colors to the coolest parts of the body or those farthermost from the heart i.e. tail, feet, ears and mask. Cats living indoors during winter will therefore be lighter than those living outside. 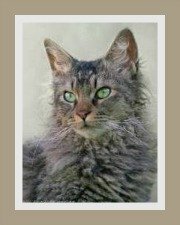 The coat darkens with age and this is something that needs to be taken into account with show cats. In some governing bodies (e.g. 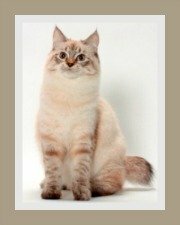 Cat Fanciers' Association - CFA) only the four original colors are accepted as Siamese coloring; and color point or point restricted, the only accepted pattern. Other governing bodies (e.g. 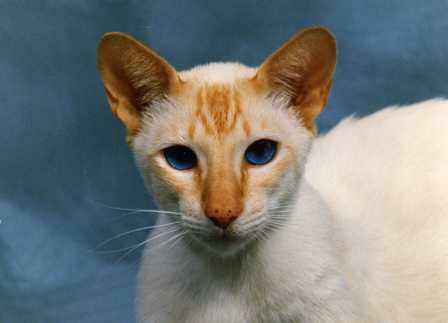 Governing Council of the Cat Fancy - GCCF) recognize the following additional colors as Siamese too. 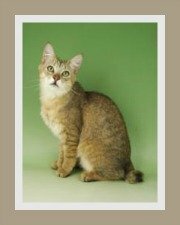 Other registries consider these colors and patterns as belonging to the Color Point Shorthair Cat. These cats do adapt well to apartment living. They have thin coats which means they are sensitive to cold. Like all cats, they do love the freedom of a garden. If they are permitted to go outside it should be into a kitty enclosure or an escape-proof garden. They prefer humans - Siamese cats don't really appreciate other cats. They do tolerate cat-friendly dogs. They prefer a home where they have companionship a great deal of the time. They make wonderful family pets and tolerate older children provided there is no rough play. 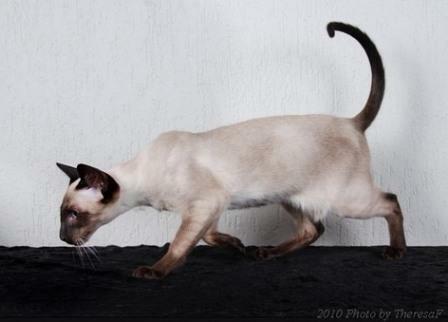 Siamese are active, playful, affectionate, outgoing, extrovert, certainly not peaceful or calm cats. They have strong personalities and are cats that hate to be ignored or left alone. They adore company and will follow their owners around just to have company. 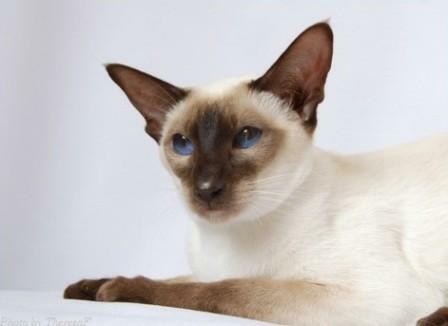 Siamese cats have a true presence and are warm, sociable and people-orientated lap cats. If you're looking for a quiet cat, then the Siamese is not for you. They are extremely vocal cats, with loud, raspy and raucous voices. Some people love these chatty, talkative cats that provide wonderful companionship, whilst others find this constant attention-seeking less favorable. It's really about choice. 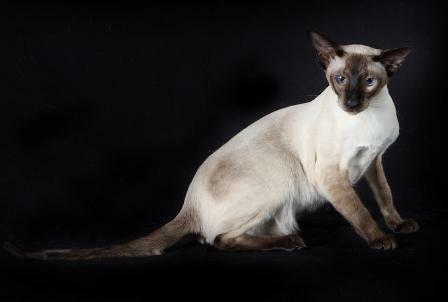 The Siamese has been described as the conversationalist of the cat kingdom. The Siamese has a very short coat and only subtle grooming is required. Use a grooming glove or a rubber brush once or twice a week to remove all dead hair without harming the coat. Bathing is not often required. A show cat should be bathed a week before show day to allow the coat to recover its natural oils. 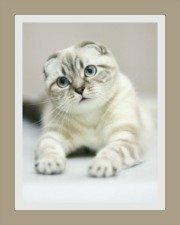 Do consider cat health insurance for your cat and vaccinate your cat against all the common infectious feline diseases. No special diet is required, but they do need to be fed a well balanced diet. The choice of cat food is up to you, but do buy a good quality, well balanced pet food. The breeder will normally provide you with guidelines on cat nutrition and the best cat food for your new Siamese kitten. There are loads of options when it comes to cat food - kibbles, moist or raw. Raw cat food should only be prepared by experts but it is a healthy alternative, to commercial dry cat foods. These cats have an average weight of 2.5 - 5.5 kg (5.5 - 12 lbs). Male cats are larger than the females. A well cared for Siamese cat has a long life span of 15 - 20 years. 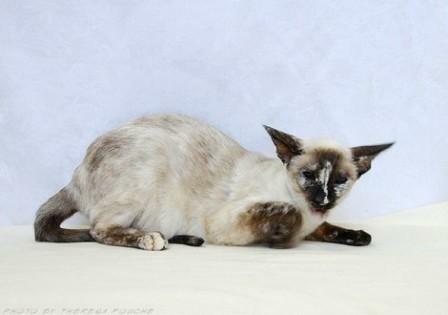 We Are Siamese is a resource dedicated to the Siamese cat. 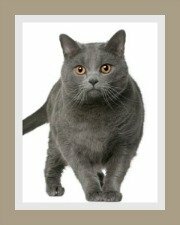 With its distinct color point pattern it is one of the most popular breeds of domesticated cats in the world.